3/4in. to 2in. 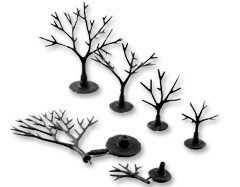 Armatures (Deciduous) - Bend plastic Tree Armatures into any shape. 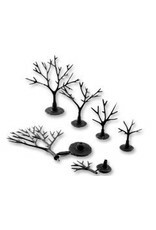 Package includes 114 deciduous Tree Armatures from 3/4in. to 2in. tall. In scale, these trees would be approximately this tall: 10 to 27 feet tall (N scale); 5 to 15 feet tall (HO scale); and 3 to 8 feet tall (O scale). Bend and twist Tree Armature into a realistic shape. Apply Hob-e-Tac Ã¯Â¿Â½ to the branches. Let dry clear and use a variety of the of the following foliage materials to make all types of trees for our layout: Underbrush , Bushes , Clump-Foliage Ã¯Â¿Â½Ã¯Â¿Â½, Foliage Clusters Ã¯Â¿Â½Ã¯Â¿Â½, Lichen, Foliage, Fine-Leaf Foliage Ã¯Â¿Â½Ã¯Â¿Â½ and Poly Fiber .